As the weather begins to cool for the Northern Hemisphere, it’s time to look for ways to extend the hanging season by hanging indoors (unless, like me, you already hang indoors anyway). If you have multiple hammocks, or are thinking of buying a hammock just for indoors, I highly recommend getting or using a hammock without a bug net (e.g., a simple, gathered-end variety). It’s just a little more convenient to get in and out. 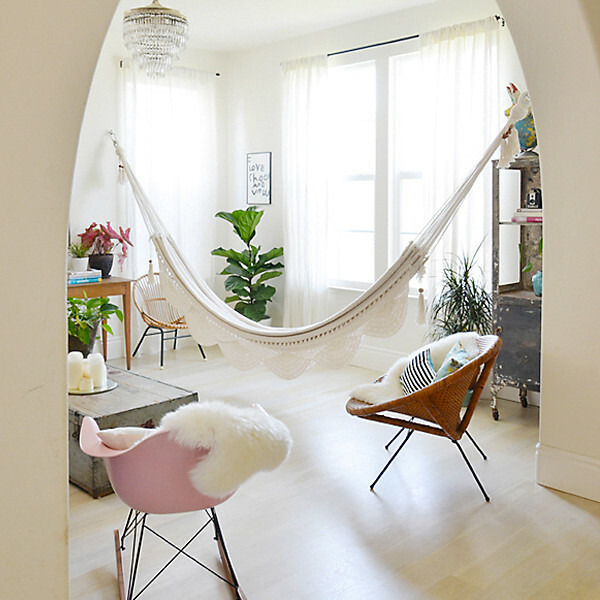 A large, cotton Mayan-style hammock is my favorite for indoor hanging. I love this inspirational photo set of a hammock used in a sitting room; it is absolute bliss. (A camping hammock with a bug net works indoors too). If your room has exposed joists or studs, you can hang indoors just as you would outdoors with the same strap and suspension system you already have. Be warned: the load from a hammock can rub off paint or create compression marks just as well indoors as out. If you plan on hanging indoors for the winter season (or longer), I recommend a more permanent solution. If you haven’t already seen it, check out my post on hanging a hammock indoors for tips and tools for drilling and securing an indoor anchor. Some folks attach an eye bolt to a board and then screw the board into multiple studs to spread out the load. A more common approach is a single point bolt. Here are a few kits I found for hanging indoors for a variety of locations and situations. If your room is modest in size, say a 10×10 ft (3×3 m) or 12×12 ft (3.6×3.6 m), you won’t need much suspension to reach from hammock to the anchor point. I use short hammock chains and S-hooks in some of my rooms. These chain segments offer quick adjustment in short increments. 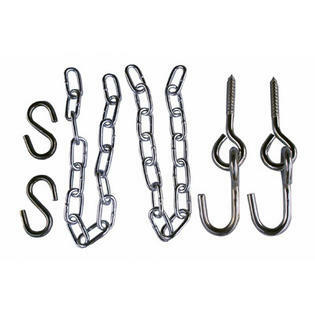 If your hammock is outfitted with short end loops, you can use a simple S-hook, or carabiner to connect to a wall anchor or to a chain segment. In my master bedroom, my hang distance is long and my wife doesn’t like the look of a steel chain hanging from the wall, so I use white webbing straps (they blend in better with the wall when not in use) and use a simple slippery Becket Hitch to attach my hammock. The Becket Hitch is commonly used in South America, but you’ll need a short rope or webbing strap that is connected to the anchor to make it work. If your hammock is outfitted with a long strap, rope, or sling on the ends of the hammock, you can tie up directly to the anchor bolt or to an S-hook or ‘biner. However, if your hang point is really high, it might help to have an extension loop to connect to. A continuous loop out of webbing or rope works well by tying a Lark’s Head through the anchor point or using a short chain segment. My regular mattress was old and I wasn’t sleeping well, so I experimented.. I welded up a pair of brackets with 1″ rings to run 4 lag bolts into my wall studs.. With the use of a tablecloth hammock, a pair of 12″ endless Amsteel loops, a few feet of homemade straps and a pair of toggles I’ve been sleeping in a hammock full time for 3 months. Because I like my sleep on the cool side I’m using a KAQ Jarbidge underquilt and I made a top quilt out of a cheap sleeping bag.. This allows me to run my winter thermostat at 60 degrees. Other than the $75 for the Jarbidge UQ (was on sale a few months ago) I have less than $50 into my “Bed” and I sleep better than I have in years. The first couple nights were touch and go because everything was new to me but by the third night I woke up 5 minutes before the alarm was about to go off, fully refreshed!! I do have to admit one thing.. It’s kinda taken the excitement out of hammock camping.. Before it was cool because you were in a hammock!! Now I’m just going to bed..
I’ve hammock camped for a year and started to spend warm nights hammocking in my back yard. Enjoyed it so much I bought a metal stand and a mayan hammock for my bedroom, replacing my waterbed about six months ago. I use an electric space heater for comfort on cold nights as I turn down the furnace to 49 degrees at night. Most comfortable sleep I’ve had in years. I went the metal stand route in part because I have a large bedroom and I wanted to give indoor hammocking a try before I started putting anchors in the wall studs. I also wanted to try different arrangements in the room before making a permanent choice. The metal stand could always be used outdoors if I decide on anchors. The stand takes up quite a bit of space and I may go to anchors for that reason. I took the gas pipe hammock stand and constructed it in my kids room in the apartment I’m currently renting. It works very well. I’m currently using some strange hardware that consists of steel plate with four holes for screws and a large steel ring. Only two of the screws are in the stud, the other two are in a piece of plywood screwed across several studs. The squeaking drives me crazy though and the walls flex when I bounce. First chance I get, I’m bolting climbing anchor plates into my walls. Seriously, even with dry lube coatings (that wear off), bloody Squeaking! Interesting! I’ve always put my anchor bolts in corners and frames where there are usually extra studs so I’ve never had squeaking issues. However, I’ve seen setups like yours and thought it would be pretty sturdy. Hi there, I’m interested in using a two-person hammock (specifically the Clark Double V or Vertex), for my fiance and I and might need to diy a hangar for it–not sure what the walls and regulations are going to be like, as we’ll be renting a student flat in Sweden. Do you have any ideas or suggestions for making a hangar that will support the weight of two average sized people (5 ft 9 in/125 lbs and 6 ft/145 lbs)? If we can drill into the wall, do you think the weight would be acceptable for the rig you suggest for indoor hanging? (Since we would have 3 suspension points rather than 2). Any advice would be most welcome! Thanks! I’d recommend that you get two individual hammocks. Easier hanging options and less movement between you. For wall anchors, the kits and techniques shown here should work but review the building first.